The Sacred: Vasuveda, Who Dwells & Shines, Said "Everything Comes Back"
You can change the fate of humanity with a laptop, but some things you never want to change. I strive to save the best of what we were. Most of all, I want to save people's voices, and if you ever hear the not yet perfect results of synthetic speech processing, odds are I was involved in their creation. The picture above is beautiful. I want to be there, too. 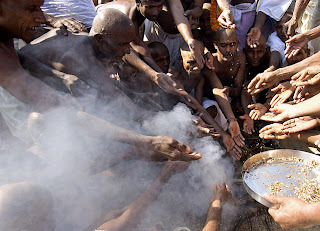 Hindu devotees from Bihar state performed rituals this Monday in Allahabad, India, the annual month-long Hindu religious festival of Magh-Mela. It was such a festival that Hesse's character Siddhartha attended and decided to give up his luxurious life as a prince, to go after something far greater. People still bathe at Sangam, at the plexus where the Ganges, Yamuna and Saraswati meet, to wash away their sins. If we could only but likewise wash ours down the River. It was the self, the purpose and essence of which I sought to learn. It was the self, I wanted to free myself from, which I sought to overcome. But I was not able to overcome it, could only deceive it, could only flee from it, only hide from it. Truly, no thing in this world has kept my thoughts thus busy, as this my very own self, this mystery of me being alive, of me being one and being separated and isolated from all others, of me being Siddhartha. And there is no thing in this world I know less about than about me, about Siddhartha. "And there is no thing in this world I know less about than about me, about Siddhartha." Therefore, we are using artificial intelligence. But hasn't it been artificial ever since we relied on memorized thought patterns instead of living hand in hand with the monkey flesh? I mean my kids watch movies, memorize lines, study what others have done and replicated it. And they are in the process of leveraging out of primal experience. Exactly. And we need to keep what was good about the primal. December 21st, 2012, the end of the world as we know it, trying to load some bases first. "My wife puts her mouth against our two month old son's belly, blows to make the sound of a whoopee cushion, and he laughs with the purest joy." and, strangely enough, only costs a minute or so of "real" time.